If you're planning a spring getaway in Britain this year you may be forgiven for thinking that you have to pack everything you own to meet the uncertainties of the British weather. We're all guilty of throwing the contents of our wardrobe in a suitcase at the eleventh hour, but a little bit of planning can go a long way to ensuring a stress free and stylish trip. Lets get the negative stuff out of the way first; waterproofs. 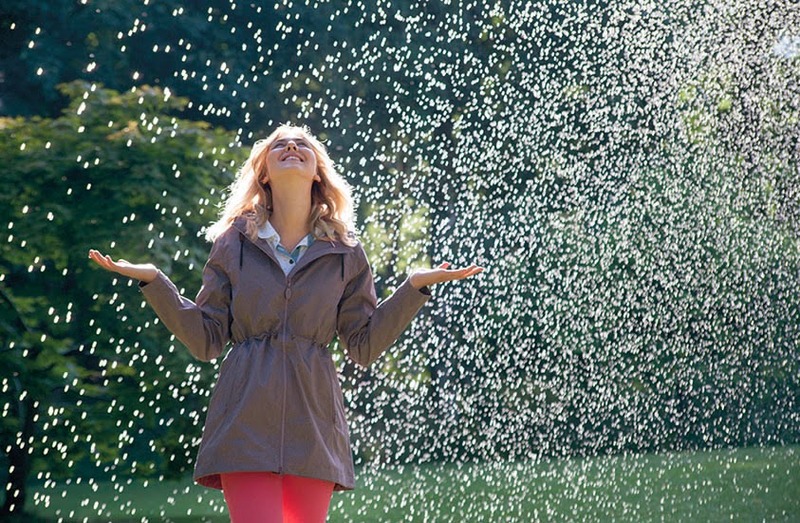 Whilst you wont want big waterproof coats cramping your mini-break style, a light mac is always an essential in the UK. Our favourite summer waterproofs are the Bernard Jacket for men, and the Tanya Jacket for women, from Jack Murphy. If you're off to the countryside, or planning on making the most of the beach whatever the weather, a pair of wellies will be your best friends. A little too bulky to pack, but make sure there's room in the boot (excuse the pun), you never know when they'll come in handy! 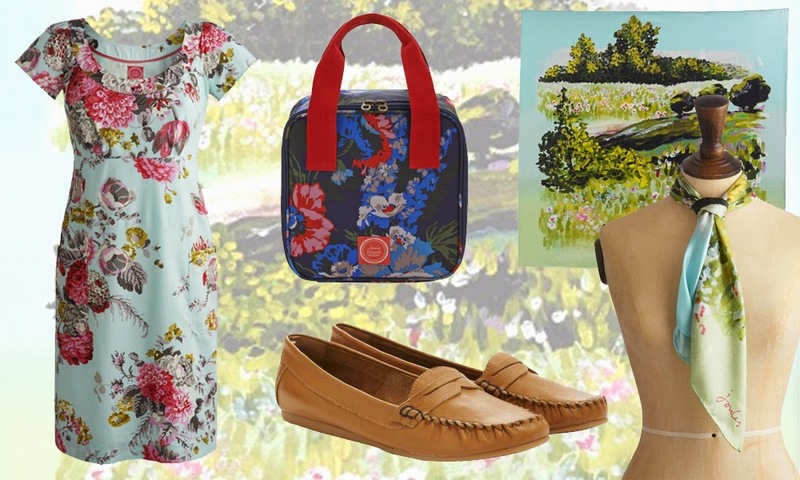 Joules do a wonderful range of wellies in bright summery styles ideal for taking away. We love the Wellyprint in either Brown Floral or Red Stripe, and the Scary Fish and Pink Pony designs are a treat for little feet! 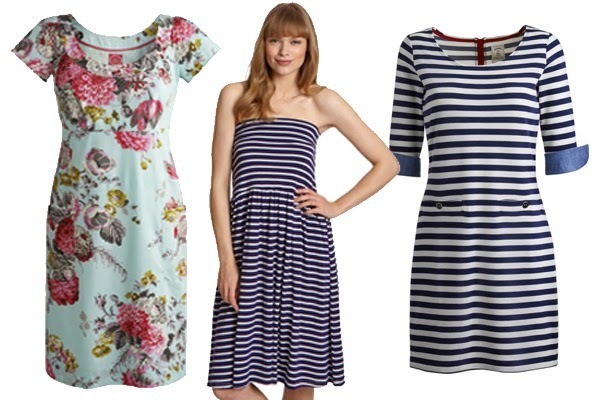 Joules Marcie Dress, Sara Skirt/ Dress and Remy Dress. For women, a cool dress and skirts and vest tops are easy to carry and can be dressed up or down for maximum use. The Marcie Dress from Joules is an absolute favourite with the girls in the office, it has a flattering cut and a beautiful, delicate pattern that captures the essence of summer in the country. For a more casual everyday style Joules Remy Dress will have you dreaming of setting sail, it's cool, casual and perfect for a day by the sea! If you're blessed with warm weather, a light skirt and vest top are a comfortable and practical choice, pair Joules Sara Womens Skirt with their Mimi Vest for instant summer style. Accessorise with a classic 'mini-break' essential, a silk scarf. These dainty, glamorous embellishments add instant style and can be worn in numerous ways; experiment with knots, wrap up your hair or, if it gets too warm, tie around your handbag strap. Joules have a beautiful range this summer - the Bloomfield Scarf, available in cream and navy designs, and the Clarence, which features a beautiful, watercolour countryside print. Men will find a fantastic choice of Polo's this year, with options from Barbour and Joules to choose from. This versatile item is great for layering and can be dressed up or down as required. Check out the Barbour Laundered Polo - available in a selection of bright colours, or the Just Joules Men's Polo. 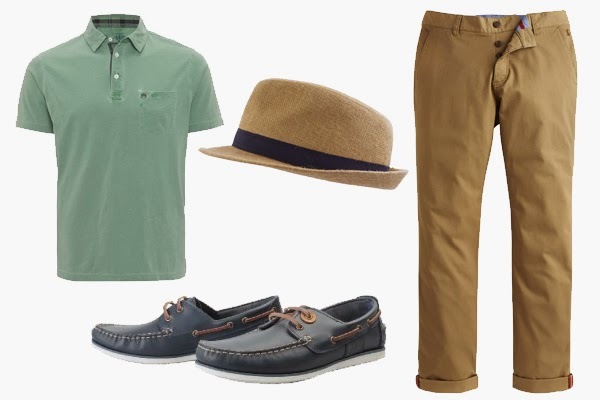 Chinos are a great item for smart/ casual dressing and will look great with pair of deck shoes for a relaxed holiday look. We think Joules Stretton Chinos would go perfectly with a pair of deck shoes - check out the beautiful options from Barbour and Musto. Stylish chaps can accessorise with Joules Halstow trilby. For a finishing touch, Joules have a beautiful range of Picnic Bags and Picnic Blankets. If you are hoping to enjoy some homemade al-fresco dining on your break they are a lovely choice, make sure you remember to pop them in the car ready for a spot of good weather!